Be the first to share your favorite memory, photo or story of Penny Jo. This memorial page is dedicated for family, friends and future generations to celebrate the life of their loved one. 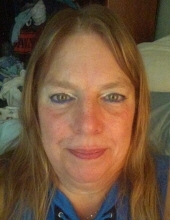 Penny Jo O’Connell, 61, of Peoria passed away Sunday, March 24, 2019 at UnityPoint Health Methodist in Peoria. She was born May 25, 1957 in Peoria to Kenneth R. and Georgette C. Klein O’Connell. Her parents and great-nephew, Michael Stratton preceded her in death. She is survived by her siblings, Rae (Patrick) Cannon, Stella (Dave) Etnier, Kevin (Carol) O’Connell; niece, Kimberly Moore; nephews, David Etnier, Rick Cannon, Todd Etnier; seven great-nieces; five great-nephews; seven great-great-nieces and four great-great-nephews. Penny was a loving, compassionate, beautiful soul. She didn’t have a single enemy, and never knew a stranger. Her first love was her family. She also loved her work family, she worked for Sharon Woods for 32 years. Her residents loved her. Penny would give you the shirt off her back. She loved life to the fullest. She had a great sense of humor and infectious laugh. She loved to blare her music in her silver PT Cruiser, dreamed of owning a Harley and had just gotten her motorcycle license. She loved Pepsi, the color green and doing her nails. Penny spent her life giving to her family, friends, and now even in death by being an organ donor. We will never recover from this loss. Penny was the definition of love in its purest form. Cremation has been accorded and a memorial service will be held on Saturday, March 30, 2019 at 5 p.m. with visitation one-hour prior at Sharon Woods Assisted Living 3223 W. Richwoods Blvd, Peoria, IL 61604. Memorials may be made to Sharon Woods or Gift of Hope in her name. To send flowers or a remembrance gift to the family of Penny Jo O'Connell, please visit our Tribute Store. "Email Address" would like to share the life celebration of Penny Jo O'Connell. Click on the "link" to go to share a favorite memory or leave a condolence message for the family.